Jesus died at 3:00 p.m. on Friday, which was the day of the Jewish Passover celebration. However, it was also Preparation Day (Mark 15:42-43) which was the day before the Sabbath (Saturday). Every kind of work had to be completed before sundown on Preparation Day (Friday) because no work could be done on the Sabbath. Joseph of Arimathea got permission from Pilate to take Jesus’ body down off the cross just before evening began. Jewish custom was that the body must be buried by sundown on the same day that it was deceased, so they hurriedly wrapped the body in linen cloth and put some spices on it to mask the smell. They then put the body in Joseph’s new family tomb that had never been used (Matt 27:60-61). The Jewish people did not believe in embalming or doing anything to preserve the body (many scholars believe the Jews of the day thought the flesh was where sin resided, so the quicker it decayed and left the bones, the better). A year or so later, the bones would be put in a box called an ossuary and they would rest with their ancestors that were already in the tomb. The next day was Saturday and the chief priests and Pharisees were concerned about someone trying to steal the body and fake a resurrection. They asked Pilate to seal the tomb with his official Roman Seal and to put Roman guards on the tomb. The seal was just wax and wasn’t designed to seal it shut, just to say this tomb is occupied and you better not touch it or you’ll answer to Rome. On Sunday, the Marys and some other women went early to the tomb to take the spices that they had prepared to finish the burial process. The Jewish custom was to wrap the body with linen and put lots of spices between the layers of linen. They would put the body on a shelf in the tomb and then close the tomb for three days. They would sit outside the tomb and mourn. At the end of the third day, they would crack open the tomb and call out the name of the deceased (Lazarus – John 11 esp. verse 17 and footnote and 38 and 39). If there was no answer, the deceased would then be legally dead and they would close up the tomb permanently. When the women asked, “Who will roll away the stone?” the stone was not the problem. They could have gotten the tomb open. The problem was the seal. Who will break the seal and incur the wrath of the Romans? When they got there, the stone was already rolled away and they could look in. Somehow, we get the idea that the angel came and rolled away the stone so that Jesus could get out. Jesus didn’t need the stone rolled back! He was the resurrected Lord! He blew out of there; no grave clothes or stone could hold him back! 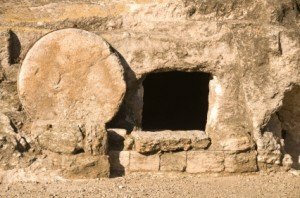 The stone was rolled away so that the disciples could look in and see that he was indeed gone, that he had risen on the third day, just as he said. The stone was also rolled away for our benefit, so that we could look inside and see that Jesus was not there. If we believe these truths, that Jesus is alive and risen, we must live in a way that shows that we are confident of these truths. 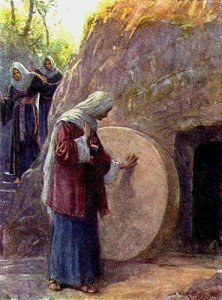 We need to roll away the stone for others around us and let them know that the tomb is empty and that Jesus is alive and risen! The resurrection not only gives us purpose and meaning in this life, but gives us the certain hope of heaven and a life after this life with Christ. 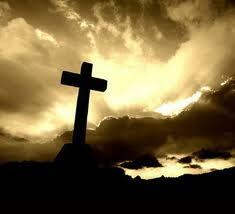 A hurting world needs to see that evidence in us that the stone has indeed been rolled away and he is risen! P.S. When they looked into the tomb, there were two angels dressed in white, one seated at the head and the other at the foot of where Jesus body had lain. This is the exact same picture that we see in Exodus 25:17-23, when God instructed the Israelites to put an angel at each end of the ark of the covenant. Between those two angels (cherubim) is where God lived and met with them. What an amazing picture that was played out 1500 years after the ark of the covenant was made! Without a doubt, the resurrection of Jesus is the defining moment in all of Scripture. All of our Christian faith originates with this one event. All of our beliefs and hopes rise or fall on the resurrection. All of the missionary activities over the last 2000 years took place because of the resurrection of Christ. Our country itself and all of western civilization is founded and based on this seminal event. No other religion claims a resurrected leader. You can visit all the other religious leaders tombs and final resting places. Probably the best way to think of it is, what if there were no resurrection? The resurrection proves that this life is not all that there is, that there is a certain hope of heaven and a life forever with our God and his son Jesus. Paul says that Jesus, the Christ and our Messiah, was the first fruits and a guarantee of that promise. This Easter season we need to come to the realization again of how much God loved us. We need to be reminded again of what he did and how marvelously amazing his redemptive plan was. God worked out every detail, from Abraham 2000 years before Christ, right down to 3:00 p.m. , the hour of his death and to his resurrection on the third day. We need to be reminded again during this blessed week of Palm Sunday, Passover, and Easter that we serve a resurrected Lord! The stone has been rolled away and the tomb is empty! He is alive! And, we have been commissioned by our resurrected Lord to go and tell this good news! He is Risen! Risen indeed! Tell the whole community of Israel that on the tenth day of this month each man is to take a lamb for his family, one for each household… Take care of them until the fourteenth day of the month, when all the members of the community of Israel must slaughter them at twilight. One of the most exciting and faith building lessons that I have ever learned in the Bible came from a study of Jesus’ entry into Jerusalem at the beginning of the week that we call Passion Week. We heard the story as we sat on the Mount of Olives and looked to the west to the Temple Mount and the beautiful city of Jerusalem. The biblical narrative came to life as we imagined the stories in their original setting. John 12:1 tells us that Jesus arrived in Bethany, a town on the Mount of Olives, on Friday, six days before the Passover. He stayed at the house of Mary, Martha, and Lazarus over the Sabbath. On Sunday, the first day of the week, Jesus left Bethany with his disciples and walked the short distance to Bethpage, another small village located on the slope of the Mount of Olives that faced Jerusalem. At that point Jesus got on a donkey and with his disciples behind him, he began to ride down the Mount of Olives towards the eastern entrances to the city of Jerusalem. The road into the city was extremely crowded that day as hundreds of thousands (if not millions, according to Josephus) of pilgrims were flocking into the city to begin the celebration of the Passover season. The Feast of Passover was the most important Jewish feast of the year and was one of the three pilgrimage feasts (Passover, Pentecost, and Sukkot) that every Jewish male was required to attend in Jerusalem. Jews came from all over the world to attend this celebration. Passover was actually coupled with the Feast of Unleavened Bread and First Fruits, and all were celebrated in succession. According to Exodus 12:3, on the tenth day of the first month (Nisan), every man was to select a lamb that would be the right size for his household to eat. The lamb had to be a year old male, without blemish or defect. The family would then keep the lamb until the fourteenth day (Exodus 12:6) and then kill and eat the lamb that evening for the Passover Meal. The day that the Israelites picked the lamb for their families was known as Lamb Selection Day. It was a very festive day and would have been similar to us picking just the right size turkey for our Thanksgiving meal later in the week. All the pilgrims were anxiously making their way into the city to pick the lamb from the flocks that the Saducees had bred and raised for this occasion. How did we miss this fact that Jesus came into Jerusalem on Lamb Selection Day? The answer probably lies in the fact that we just don’t know the Old Testament very well and are not familiar with what was involved in the Passover celebration. The lamb was killed on the evening of the 14th, which would have been on Thursday in the story of Jesus’ last week. By counting backwards to the 10th , we see that in fact it was on Sunday that the Israelites would have picked their lamb. This was no coincidence that Jesus came on that day to say, “I am the Passover Lamb”! From Genesis (Genesis 22:8 – “God himself will provide a lamb”), to Revelation (Revelation 5:12 – “Worthy is the Lamb, who was slain”), Christ is our Passover Lamb! And, just to make sure we got it, God sent his son into Jerusalem on the very day that the Jewish people had been picking their lamb for the past 1500 years! What a God of detail and precision! The date and time had been fixed since the foundation of the world and everything was planned down to the last detail! Every dot was connected and every piece of the puzzle fit exactly. Although the crowds had hoped he was coming to be their warrior king, God had a much different battle plan. He sent his son, the King of the Universe, to humbly die as our Passover Lamb to save us from our sins. This is the season of Passover and Lamb Selection Day is here! What an excellent time to thank Him for His sacrifice! A new phrase that I learned while on a recent trip to Israel was the Greek words for a solitary or lonely place, ”Eremos Topos”. I looked through the Gospels and found as many references to this phrase as I could. The ones that I could find are listed in the above scripture references. A solitary place, as described in the Gospels,would have been a steep or rocky location where you would not have been able to farm or cultivate and nothing would grow. If you were a rabbi and you wanted to take your disciples somewhere to teach and instruct them, you would be looking for a place that was remote and not cultivated. You would not want to be walking over and through someone’s plot of farm ground. You would want to take your disciples up the hill as far as you could to get away from the crowds and find one of these solitary places to do your teaching. There are not many places around the Sea of Galilee, where Jesus conducted most of his ministry, that weren’t cultivated or used in some way. There are only a few locations that would qualify as, “Eremos Topos’. While we were hiking by the Sea of Galilee, our guide took us to an “Eremos Topos” right by the edge of the lake, between Capernaum and Magadan. The location that we went to was the traditional place where scholars feel that Jesus would have taken his disciples when he fed the five thousand and then later in the night walked out on the water to his disciples. While we sat in this solitary place late in the evening and looked out over the Sea of Galilee, we read these two Bible stories out loud. The mental picture was very moving, as we could see and visualize these stories happening right in front of us. It was a very emotional experience and one that I will never forget. Now, when I read the gospels and think of Jesus going to a solitary place, I have a much fuller mental picture of what was happening. And he took the calf the people had made and burned it in the fire; then he ground it to powder, scattered it on the water and made the Israelites drink it. 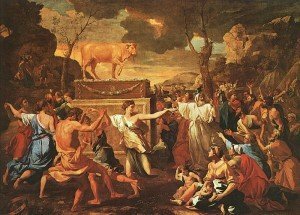 As you read the story of the Golden Calf Incident in Exodus 32, Moses does what appeared to be a random and strange event. He took the golden calf, burned it in the fire, and then ground it into powder. Next, he scattered the dust of the golden calf over the water and made all the Israelites drink it. I always wondered why Moses did that and what was accomplished by making them drink the dust and water. As usual, I didn’t know my text, and was shown by my teacher why Moses did this to the Israelites. If you look in Numbers 5:11-24, you will see that God gave Moses a test to determine if a wife had secretly been unfaithful to her husband. If a husband suspected that his wife had been impure and unfaithful, he was to take her to the priest. The priest would take some of the holy water and put some dust from the tabernacle floor in the water and then make the woman drink it. If she was guilty of immorality her abdomen would immediately start to swell up and she would be under terrible suffering and would be childless from then on. She was to be under a curse for her unfaithfulness. This was exactly what Moses did to the Israelites! God was saying, “You have been an unfaithful wife to me, you have chased after other gods. I’m going to give you the test for an unfaithful wife and if you are guilty, you will pay dearly for it.” God brought severe punishment on them for their unfaithfulness. Three thousand died that day for their role in committing spiritual adultery. Although the text doesn’t specifically say it, it is possible that the ones that got sick were the ones that were killed by the sword. This adds so much more meaning to the Exodus story. God had told the Israelites that he loved them like a bride, that he would take them for his own, and brought them to himself. While he and Moses were up on the mountain writing the marriage contract (Ten Commandments), his bride was down below committing adultery! God was mad at them for their unfaithfulness and made them pay for their sin. But, as we so often see in the scriptures, God takes them back and starts over again.